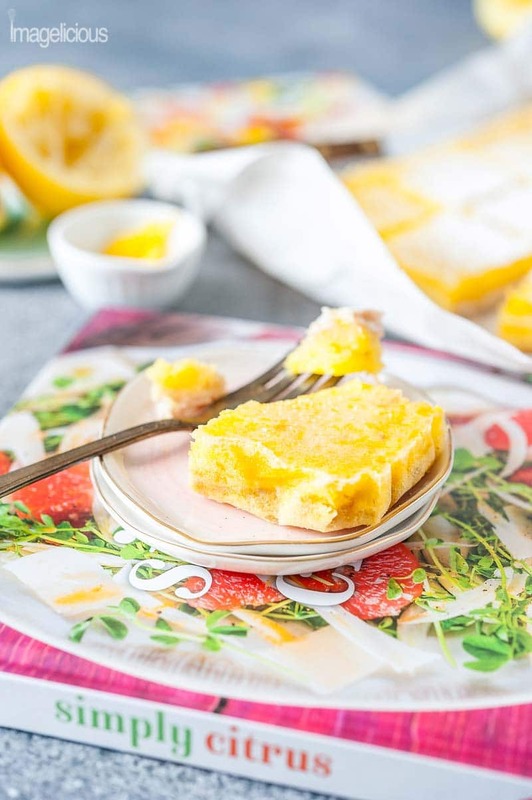 These Coconut Lemon Bars are sweet and tangy with a hint of tropical coconut. They are easy to make without as the lemon curd does not need to be cooked in advance. They look gorgeous and are a perfect addition to a cookie platter. 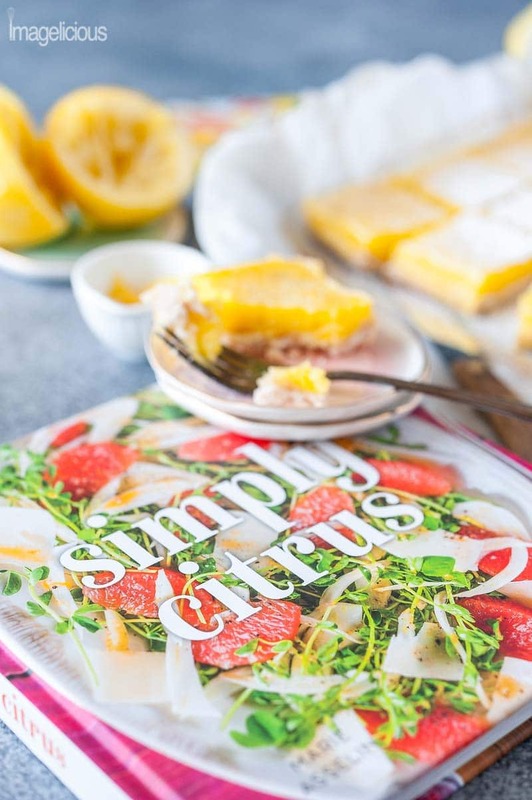 I received Simply Citrus cookbook free of charge, however all the delicious opinions are my own #SimplyCitrus. This post contains Amazon affiliate links, which means that if you purchase an item after following one of those links, I will receive a small commission. Citrus is one of those flavours that does not have a season. Mandarine oranges always remind me of winter. Yet, lemons are forever associated with summer lemonade. Limes and frosted beer glasses transform me to hot Caribbean vacations. Citrus flavours add so much brightness to so many foods and recipes. I can’t imagine having fish without a squeeze of lemon. I love tart grapefruit juice in glazes, And cute little kumquats are delicious (and beautiful) and fresh green salads. If you love citrus as much as I do, then Simply Citrus cookbook from Marie Asselin will bound to become your favourite. I recently received my copy and I can’t stop leafing through it. Instead of traditional chapters like Breakfast, Lunch, Dessert, etc., this cookbook is divided by a type of Citrus. With chapters on Lemons, Limes, Oranges, and other delicious citrus fruits. Each chapter has a variety of recipes including appetizers, mains, desserts, and drinks. 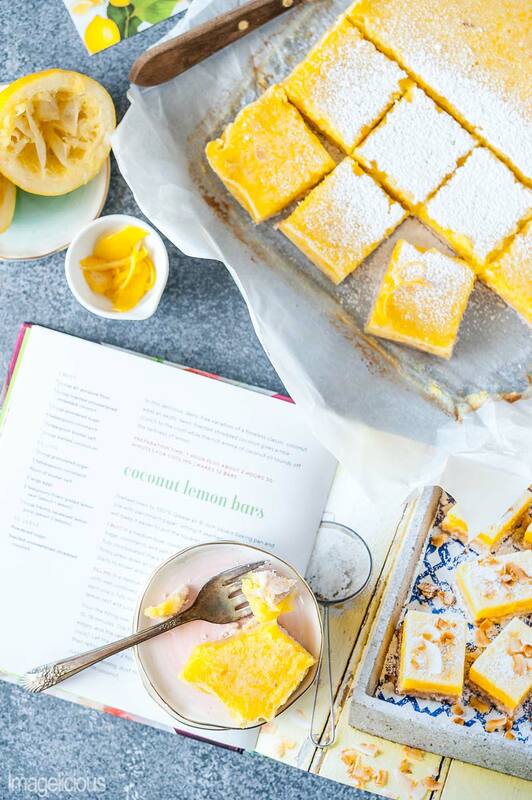 I only tried Coconut Lemon Bars from the book so far, but I already made them twice and these delicious bars will become a staple in my dessert repertoire. I am also keeping my eye on a Mandarin and Raspberry Ricotta Tart (because I love anything made with ricotta). And Broiled Fish Tacos with Avocado-Grapefruit Salsa are calling my name. Simply Citrus cookbook offers so much variety and flavour that I don’t even know where to start. The gorgeous photographs by Catherine Côté make choosing a recipe to make even more difficult. 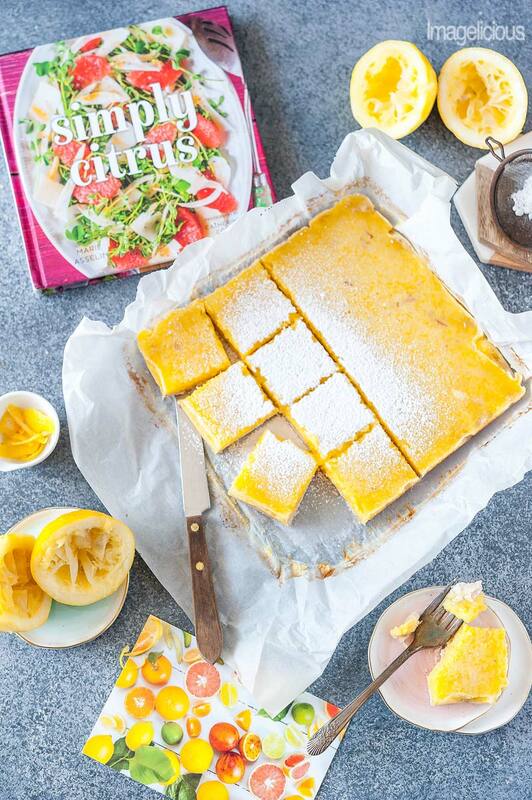 Now that I’ve sung my ode to this beautiful and delicious Simply Citrus cookbook, let me tell you about the Coconut Lemon Bars that I tried. Twice! They are Ah-May-Zing! Tart, zingy, sweet, creamy, crunchy. They have everything you want in a good lemon bar and more. 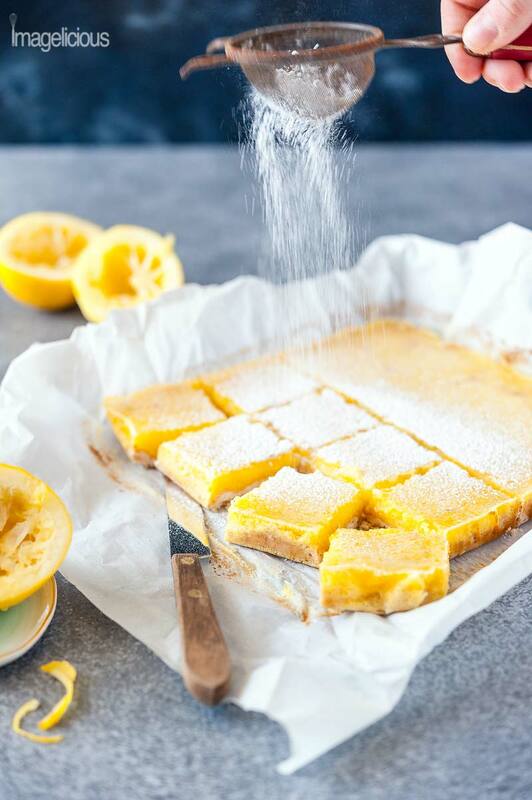 I love lemon bars but I rarely make them because most recipes require you to cook lemon curd first. These Coconut Lemon Bars don’t need any advanced preparations. They are also dairy free if this is something you care about. Ingredients are common with nothing out of the ordinary, so these bars are really easy to make and half of the time you won’t even need to make a trip to a grocery store. First, you make the crust which is really easy, just combine melted coconut oil, flour, shredded coconut, and icing sugar, then bake for a few minutes. Then, while the crust is baking, you make the filling which is even easier than the crust. Whisk together eggs (no need to only use egg yolks, the whole eggs are used in this recipe), sugar, lemon juice and lemon zest. Lastly, pour the filling onto the hot crust (I love hearing it sizzle) and bake for 15-18 minutes. Cool, refrigerate, and enjoy. So easy! 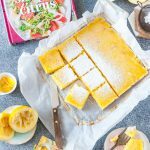 The recipe for these Coconut Lemon Bars has two steps which usually is not something I like. I am all about one step recipes: mix and bake. But in this particular case, I don’t mind the baking of the crust at all. In fact, by the time I finish juicing and zesting the lemons, mixing the filling, and then cleaning up, the crust is done cooking and it’s time to pour the delicious lemon curd in. With no separating of eggs or pre-making the curd, I’d say this recipe is perfect for a beginner baker. The Coconut Lemon Bars look gorgeous and impressive and they taste even better. I made these bars twice already and will definitely make many times more. The second time I made the recipe I made a few tiny changes. I did not toast the coconut for the crust the second time and I personally did not find any noticeable difference in taste. I only had extra large eggs the second time so I used those and there was also no change in the texture of the curd. I reduced the amount of sugar in the filling by 2 tablespoons but this is only because I personally like less sweet desserts. Oh, and I also added a splash of coconut extract to the crust for extra coconut-ey flavour. This recipe is so delicious that I can’t wait to try more recipes from this cookbook. Preheat the oven to 350F. Line an 8-inch square baking pan with parchment paper. In a medium bowl, combine the flour, shredded coconut, powdered sugar, cornstarch, and salt. Add the melted coconut oil and mix until everything is well combined. The mixture will be a bit crumbly. Place the dough into the prepared pan spread it in an even layer, firmly pressing down. Bake the crust until the edges just start to brown, about 15-20 minutes. It takes about 18 minutes in my oven. In a medium bowl, combine the sugar, cornstarch, and salt. Add the eggs and whisk until the mixture is smooth. Add the lemon juice and zest and whisk well to combine. Pour the filling right over the hot crust. Make sure to whisk it well just before pouring it over the crust. Bake for 15-18 minutes until it just starts to turn golden around the edges but the centre is still a bit jiggly. Let the pan cool completely to room temperature, and then refrigerate for at least 2 hours before cutting. The filling will firm up in the fridge. Serve with a light sprinkling of icing sugar. I added about 1/4 teaspoon of coconut extract to the crust and a splash of extract to the filling to bring out even more of the tropical flavour. The second time I made these Coconut Lemon Bars I used untoasted coconut. I used both large eggs and extra-large eggs with great results. The second time I reduced the sugar in the filling by 2 tablespoons, only using 1/2 cup and 2 tablespoons of sugar. Next time I'll reduce it even further to only use 1/2 cup sugar. Lemon Meringue pie is the best. My favourite recipe using citrus is lemon meringue pie! My favourite is coconut lemon bars. Fingers crossed that I win because I would love this cookbook! My favorite thing to make with citrus is probably either lemon cookies with a lemon glaze, or my SIL’s knotted orange sweet rolls with an orange glaze. They are SO good and I’m making this weekend for Easter! I cannot wait to try these bars though! Those bars look amazing, and I am definitely excited to try them out soon. My personal favourite dish to make with citrus is key lime pie, but I am excited to check out this book and get some new ideas for ways to incorporate citrus into my meals. I love lemon bars actually! These sound great with the coconut crust! A good lemon cake is my fave! 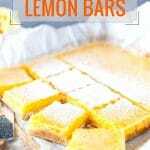 I LOVE citrus desserts and lemon bars especially. The coconut in the crust sounds like such a fantastic pairing. Your photos are gorgeous, too. I’m very much in need of “summer,” and these bars look like pure sunshine and warm weather. Definitely entering the giveaway for the cookbook, it sounds like one I’d love! I just LOVE the color on these bars! SO vibrant, inviting, and PERFECT for Spring! This cookbook sounds amazing, just up our alley. My husband and little one love lemons so much, they’ll actually eat them raw!! I can’t wait to make these for them! I’m not sure that I’ve ever eaten a lemon bar! BUT I love all things citrus, and I’m sure I’d love these. (Especially your less sweet version.) Your photos here are gorgeous as usual! !